Fish sticks are very nostalgic for me for better or for worse. My kaleidoscopic memories of them jump from being served rubbery thawed frozen fish sticks for lunch at my school cafeteria to lazy Tuesday dinner nights where they were our last resort after when we couldn’t decide what we wanted for dinner. I guess those incidents are what partially turned me off from fish sticks. While I liked the convenience of heating up a package of frozen fish sticks without having to wait long, I paid for my laziness in other ways. I suppose not all shortcuts are worth taking. That is when I subconsciously decided to nix fish sticks until I recently ventured on making healthy fish sticks from scratch and it made all the difference in the world. As someone who is health conscious, I am always in need of a healthy fix. Commercial prepackaged frozen fish sticks always result in a mushy exterior while the fish is always soggy no matter how much you heat them. Moreover, they are laden with chemicals and artificial flavoring – you can actually taste them in every bite. They were also incredibly greasy and just overall unappetizing. That is why I quit the prepackaged frozen fish sticks and journeyed on healthy baked fish sticks recipes and ideas. I also decided to redeem a once favorite childhood finger food by making homemade fish sticks. Once again, my stubbornness, need of new fish recipe ideas and curiosity got in the way. Like most things, making fish sticks is easy and quick. Once you tried this oven baked fish sticks recipe, you will never go back to that frozen soggy greasy disgrace for fish sticks. I used hake but you can use any firm boneless white fish for this recipe such as cod, tilapia, or halibut. Flounder results a more delicate fish stick that will fall apart. The choice is yours. Unlike the garbage that we were accustomed to eating as kids, these healthy baked fish sticks guarantee a crispy breadcrumb exterior and a buttery moist fish inside without the chemicals or the deep frying. Finger food is always accompanied by a condiment of sort. Chili sauce is my choice but you can use your favorite condiment. Kid-friendly and fun to make, these healthy baked fish sticks serve perfectly with oven baked potato wedges or roasted vegetables. Preheat the oven to 450°F and adjust the rack to the center position. Spray a large rimmed baking sheet with oil. Combine all ingredients in a shallow small bowl except for fish and bread crumbs. Working with a few pieces of fish at a time, dip the fish in the wet mixture then coat all the sides with bread crumbs. Spray the top with cooking spray and bake for 12-15 minutes or until crisp and cooked through. 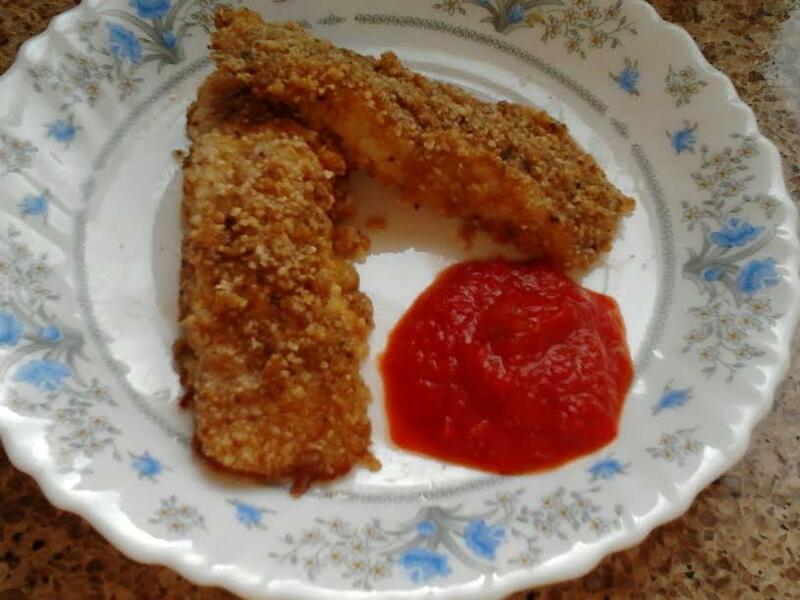 This entry was posted in Fish and tagged baked fish sticks recipe, healthy baked fish sticks, homemade fish sticks, make fish sticks scratch. Having been exposed to the Middle Eastern culinary culture, I am ashamed to admit that I nearly forgot about shish kebabs. It nearly would have never occurred to me to make shish kebabs until hubby recently mentioned that he had a hankering for them. Otherwise, the notion would have never surfaced. Reflecting back on that thought makes me wonder why the thought of learning how to make shish kabobs has never entered my mind even once after all these years of eating schwarmah, hummus, harif, pita, and falafel. I knew I was leaving something out but I couldn’t remember what it was. I suppose shish kebabs have unintentionally sat in the back seat for a while as it has been years since I’ve last eaten one. I only remember eating one at a Middle Eastern themed restaurant a while back when I was around 10. I nearly forgot how good they were. I am thankful that he requested for them as it was indeed a good idea in hindsight. So what is a shish kebab? A shish kebab is a skewer with meat and vegetable that is normally grilled. It’s practically a meal on a stick. It consists of beef, chicken fish, as well as vegetables such as onions, peppers, mushrooms, tomatoes and eggplant. Shish kebab comes from a Turkish term that translates as skewer and roasted meat – a signature Turkish dish. Kebabs back then were a solution for nomadic tribes. A shish kebab marinade was not only used to tenderize the meat but to also neutralize the gamey flavor in some of them. Nowadays, the shish kebab has entered into most cultures in some form or another. For instance, Asian cultures have satay, roasted skewered meats served with a peanut dipping sauce. Yakitori, a Japanese version, is essentially skewered grilled fowl. Shish kebabs are also known as brochettes in France which literally means skewers. For a medium-rare cook on your meat, it is recommended that you use wooden skewers instead of metal skewers metal has the tendency to absorb heat more. Understandingly, getting splinters in your mouth from eating the kebabs right off the skewer doesn’t sound pleasant. Fortunately for me, I never had that problem even though I can sometimes be clumsy when eating using my hands. If you don’t like the idea behind using a skewer, you can just pan-fry the ingredients and stuff them in a pita or laffa once they’ve been cooked. Shish kebabs are a perfect choice for a family/social gathering or a barbecue. The versatility of shish kebabs allows you to use any combination of ingredients of your choice to please the palate. While meat is an integral part of shish kebabs, you can create your own vegetarian version for this shish kebab recipe by exclusively using vegetables or vegan chicken/beef. Shish kebabs can be prepared in advance, making it a crowd pleaser for your guests while simultaneously keeping you out of the kitchen. I used chili sauce among other condiments and spices for my shish kebab marinade but feel free to let your imagination run wild with your own marinade. 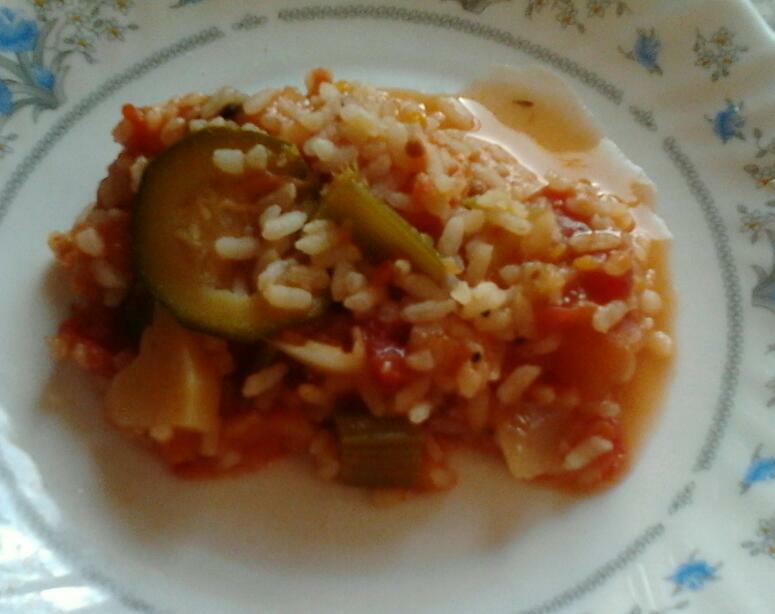 Combine the last 9 ingredients with the meat in a bowl. Cover and marinate for several hours. Preheat oven to 400 degrees F. Thread meat, alternating with the vegetables, onto skewers. Place an oven-proof cooling rack on a baking sheet lined with aluminum foil. Place shish kebabs on a rack and bake for 15 minutes for medium doneness. 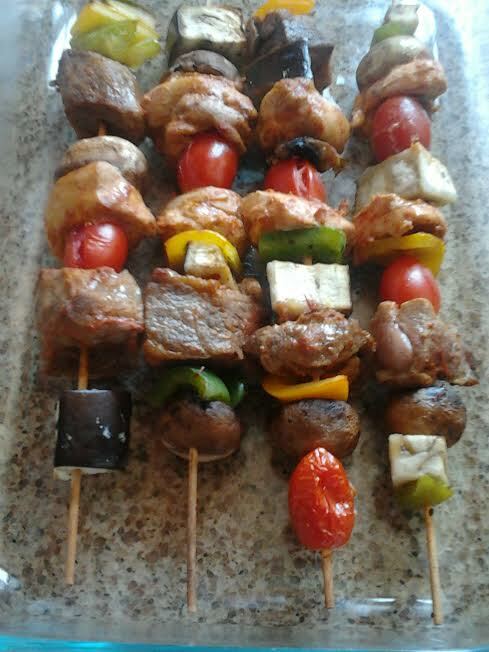 This entry was posted in Gluten Free, Meat, Sugar-free and tagged how to make shish kebabs, shish kebab in oven, shish kebab marinade, shish kebab recipe. Berry smoothie recipes are on the top of my favorite smoothies. Smoothies basically constitute my breakfast. Sometimes I will whip up a berry smoothie protein shake after an intense workout. Smoothies have been my to-go quick breakfast for a while. 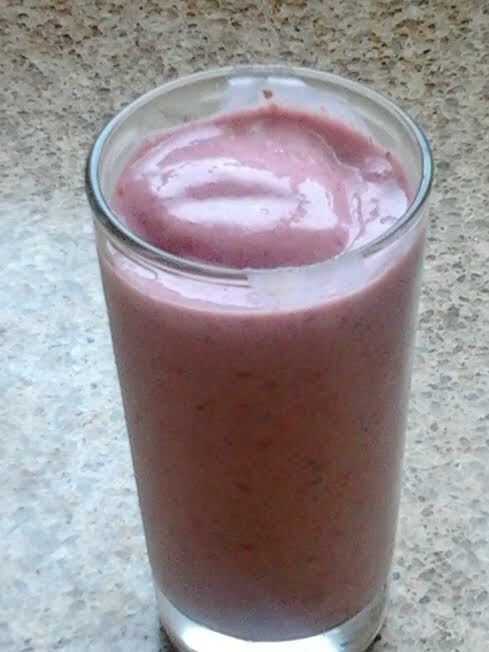 Fruit oriented smoothies usually consists of bananas and frozen berries. This time, though, I exclusively wanted berries. There are many thrifty ways of learning how to make a healthy breakfast using frozen berry recipes. Red berry smoothie is the only recipe that seems most feasible to me. Smoothies are a healthy way to make most of the berry season with one glass of berry goodness. Those who know me well can vouch for my compulsive berry noshing. Fresh berries are a treat for me; I can’t ever have enough of them. Aside for their amazing combination of sweet and tart flavors, berries are low in calories, high in fiber, and they contain vitamins and minerals your body needs to function normally. So think twice before complaining to me about overstocking on berries. Until recently, I never gave much of a thought of learning how to make a healthy breakfast. I normally relied on a bowl of cereal and milk to keep me energized without reviewing the nutrition facts. Consequently, I would experience a frequent sugar crash. I didn’t entirely cut cereal out but I had to part ways with certain brands. Until I moved overseas, I have been living off of Kashi cereal brands. Unfortunately, they are not available where I live. It was either oatmeal or smoothies and I don’t always have the patience or the time to cook oatmeal. Additionally, oatmeal has the tendency to leave me feeling bloated and I don’t wish to jumpstart my morning with a case of gastritis. Food for thought, red berries offer a higher concentration of antioxidants than most other foods, and summertime is the prime time to indulge in these red gems. This red berry smoothie recipe is a great way of using fresh or frozen berries and creating a smoothie that not only has strong impact of flavors but is nutritious for you and easy to make. I nearly forgot to mention that they are super filling and can keep me fueled till lunchtime. Place all ingredients in a blender and blend till smooth. Serve chilled. This entry was posted in Breakfast, Gluten Free, Sugar-free, Vegetarian and tagged frozen berry recipes, how to make a healthy breakfast, red berry smoothie recipes. Just when I thought I was a food encyclopedia, my knowledge was challenged when I first met tempeh. It was a real low blow for me. I am having my midday drama flare. While I am indeed a foodie, I still have a lot to learn. I am in the toddler stages of learning how to cook vegan dishes apart from side dishes, soups, and salads. Until recently, I never heard of tempeh. When I was first introduced to tempeh, it didn’t sound any more appealing to me than tofu. But I have seen people cook with tempeh and boast about it so I felt inclined to try. I would like to thank some of the food bloggers here who have cooked with tempeh for the inspiration. If it weren’t for you, I would never have bothered to muster up the courage nor appetite to try some for myself. Tempeh is made from fermented soybeans and is a staple in Indonesian cuisine. It has a firm texture, nutty flavor, and considered to be a more nutritious way to consume soy than tofu. It’s rich in fiber, fatty acids, protein, minerals, and vitamins. Like tofu, tempeh is perfect in a stir fry, crumbled in stews or soups, marinated, and fan fried. Whatever the instance, tempeh requires slicing or breaking down into smaller pieces prior to cooking. For this particular tempeh recipe, I sliced my tempeh into neat rectangles rather than cooking it whole. Whisk orange juice, maple syrup, soy sauce, ginger, garlic, chili pepper, and coriander in a small shallow bowl. Boil tempeh in a pot of unsalted water for 10 minutes ; drain and pat dry. Heat oil in a large skillet over medium heat. Add tempeh and brown on both sides. Pour in orange juice mixture and simmer until the liquid is a thick and syrupy glaze. Serve tempeh over rice or steamed vegetables. Garnish with chopped fresh cilantro or scallions. 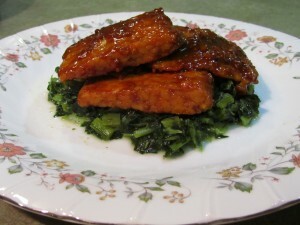 This entry was posted in Gluten Free, Sugar-free, Vegetarian and tagged Meatless Monday, orange glazed tempeh, tempeh recipes, vegan dinner idea. Butter and margarine have been perpetually competing with each other over prime space at supermarkets in effort to win consumership from customers. But which item is considered to be more heart healthy? Trans fat free margarine- vegetable oil spreads are more preferable above margarine and butter. The reason for this lies within the different types of fat found in both margarine and fat. Made from animal fats, butter is high in artery-clogging saturated fats. On the other hand, margarine is gerneally made with vegetable oil and therefore contains polyunsaturated fat. Even though margarine has less saturated fat content than butter, the lard varieties such as stick margarine has high trans fat content. Trans fat is nearly impossible to avoid. They are mostly found in processed and commercial goods. What arre trans fats then? Trans fats are manufactured by hydrogenation, a process in which vegetable oils are transformed into solid fats. Trans fats are used in cookies, crackers, and pasteries to improve the flavor and texture of these goods as well as to prevent them from going stale quickly. Akin to saturated fats, trans fats have been shown to raise LDL cholesterol but can lower levels of HDL cholesterol as well. According to many studies, trans fat can increase the risk for obesity, diabetes, Alzheimer’s, and cancer. Likewise, transfats are considered to the worst type of fats and should be avoided. I use margarine a lot in my baking. I was elated to discover trans fat-free alternatives. Learning how to make homemade margarine from scratch wasn’t difficult either. It’s certainly preferable to the oft-maligned version. As someone who has been monitering my cholesterol level for quite some time, I can never be too careful. Although margarine still has a second class status in the cooking world, more people are using it twice as much as they do butter. When making this vegan butter, it is no more high-tech than it was when it was first made back in 1869 by the French – a mixture of solid and liquid fats, emulsified by hand, but not as labor intensive nor nerve racking as making hollandaise sauce. But don’t just take my word for it. This homemade dairy-free margarine recipe is so easy to make, its is a delicious substitute to store-bought vegan margarines. You can modify the taste by adding herbs or spices of your choice. Remember, it won’t harden as much as it doesn’t contain hydrogenates or trans fats. Place all ingredients in a food processor using a plastic blade. Blend on medium-high speed until ingredients are well incorporated and mixture has thickened. 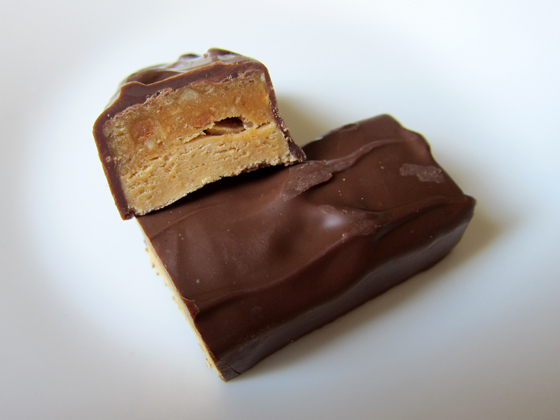 Pour mixture into a 2 cup shallow container and freeze for several hours or overnight. Remove margarine from freezer at least 10 minutes before use. Store in freeze for about a month. 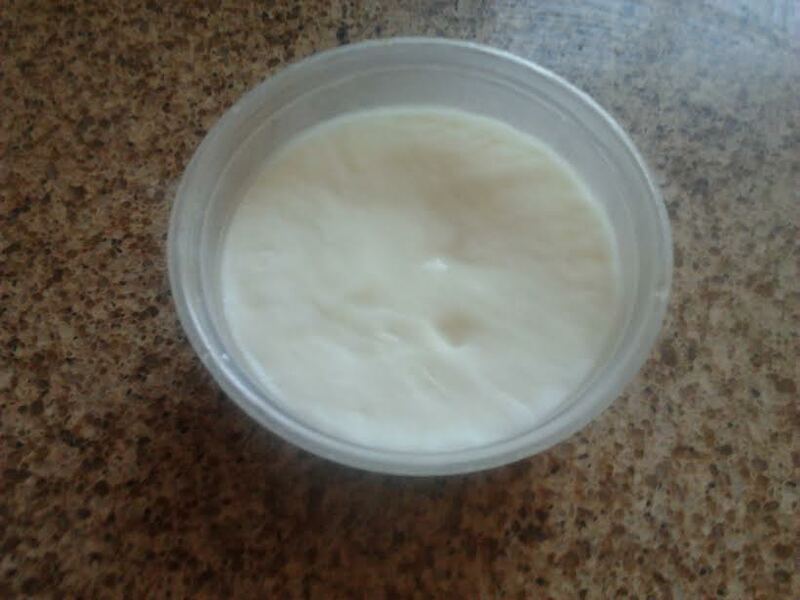 This entry was posted in Gluten Free, Sugar-free, Vegetarian and tagged dairy-free margarine recipe, how to make homemade margarine, margarine or butter, vegan butter.